After Signing Cuban Defector With Weird Workout Video, Have The A's Had The Strangest Offseason Ever? What is going on Oakland? (No, not this.) 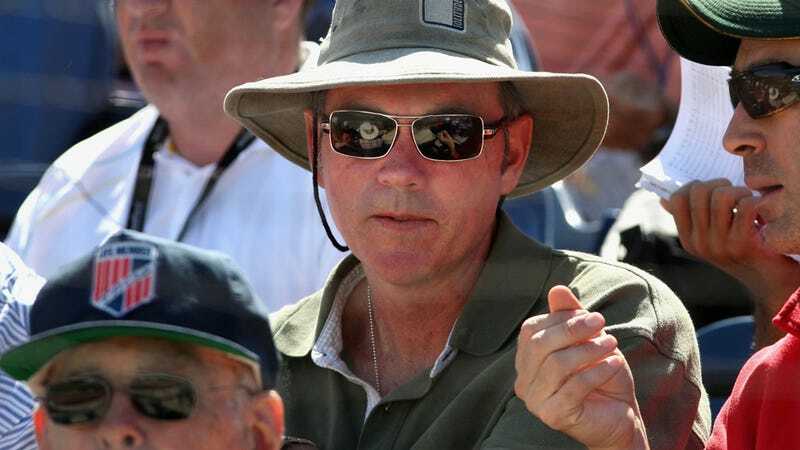 Billy Beane's done some things. He traded two young All-Star starters, Gio Gonzalez and Trevor Cahill, to the Nationals and Diamondbacks. He traded away his closer, Andrew Bailey, and Craig Breslow, another reliable reliever. Then he traded away two more starters, Guillermo Moscoso and Josh Outman. In return, he got a lot of prospects, and Josh Reddick and Seth Smith. Somewhere along the way, Beane re-signed Coco Crisp, replaced Josh Willingham (who signed in Minnesota) with Jonny Gomes, added Bartolo Colon, and wooed Manny Ramirez, who hasn't made his decision yet. But the Cespedes signing is not terribly important on its own to us. We don't know much about what he'll do as a pro. Rather, we're interested in Cespedes as the crown jewel of the weirdest offseason in recent memory, where the A's dumped a bunch of good, young players for a bunch of even younger players, including one named Brad Peacock. They talked to Manny Ramirez, who was arrested after alleged domestic violence and faces a 50-game suspension for PEDs. And they signed another who roasted a pig on a spit in his highlight video. I cannot recall a team having an offseason this wacky. Billy Beane, everyone.